Uke attempts a yokomen strike to tori's head with his right hand. 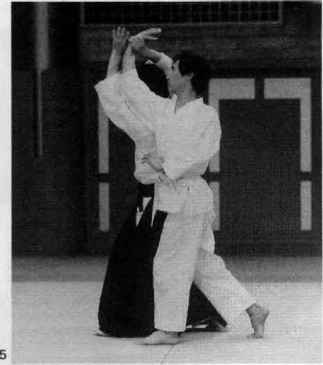 Tori slides forward on his left leg, then takes a wide step forward on his right leg. 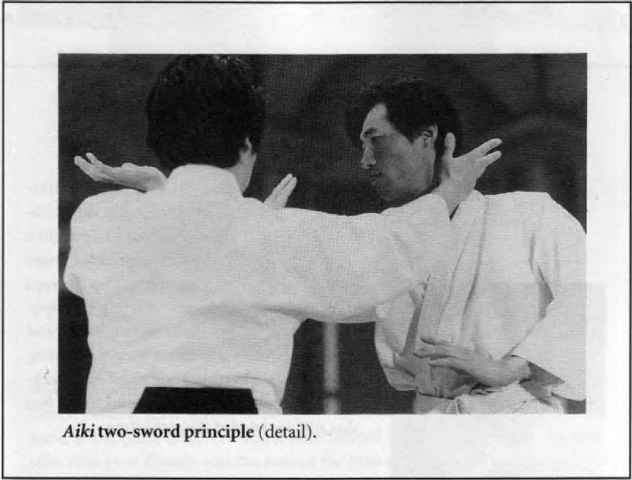 Then tori simultaneously blocks uke's attack and delivers a counter-blow to uke's neck, in the aiki two-sword style. Next, tori shifts his right hand to take hold of uke's pulse (myaku-mochi no den). 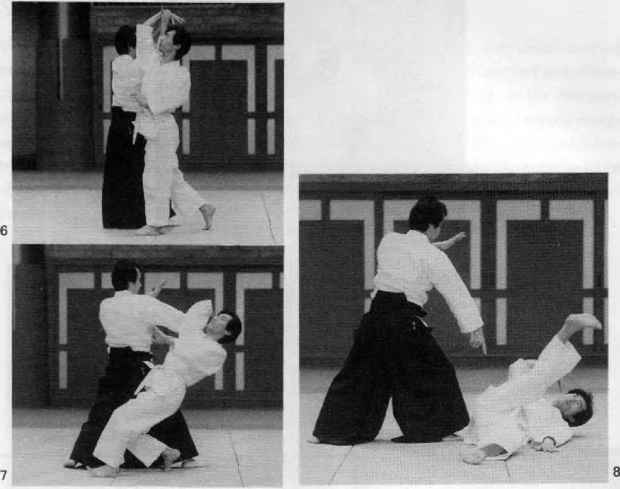 Tori steps forward on his left leg, raises his hands as if lifting a sword heavenward, and> after planting his left foot, turns 180 degrees, keeping uke's arm in front of his own center while cutting downward toward the earth (tenchi no den) to effect the throw. 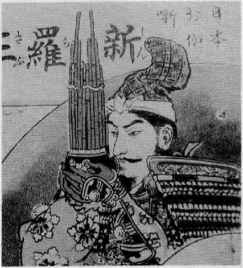 Tencht no den (detail). 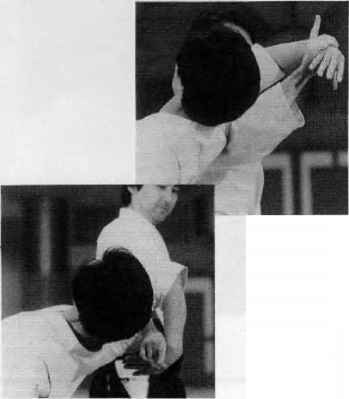 Lit., "heaven/earth" movement, When you do shiho-nage, grasp your opponent's hand, with your index finger sticking straight up (toward "heaven"). 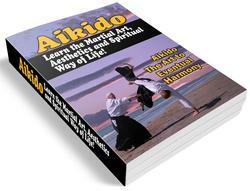 Twist your opponent's wrist outward and conclude with your index finger pointing down (toward earth). Your shiho-nage technique can be made extremely effective if you also add yonka-jo at the same time. Myaku-mochi no den (detail). Use the thumb to apply pressure to your opponent's pulse. 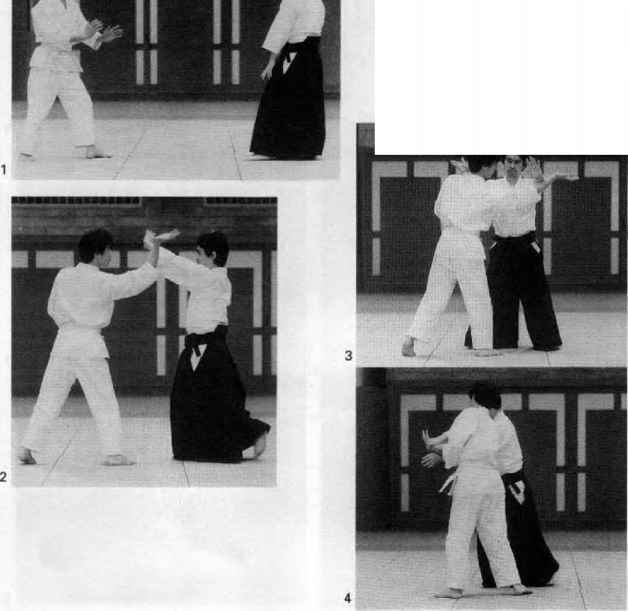 It is not effective, however, to immediately grasp the opponent's hand at the pulse area. The secret here instead is to grasp from the opposite side, with your thumb near the base of the little finger, and to slide it down to the pulse.